This will be a cut-to-length project. A processor will travel corridors through the stand, reaching in and cutting selected trees, limbing and bucking them all in one process. There are many advantages to this type of harvest system. For example, the machinery travels over the bed of slash it produces, minimizing soil disturbance. Also, cut-to-length is efficient in terms of time, labor and precision cutting of the logs to maximize scaling. Some of the disadvantages are that it requires advance planning, there are relatively few operators often booked out far in advance, and the fixed costs are relatively high. Here’s a video of one type of cut-to-length machine working. 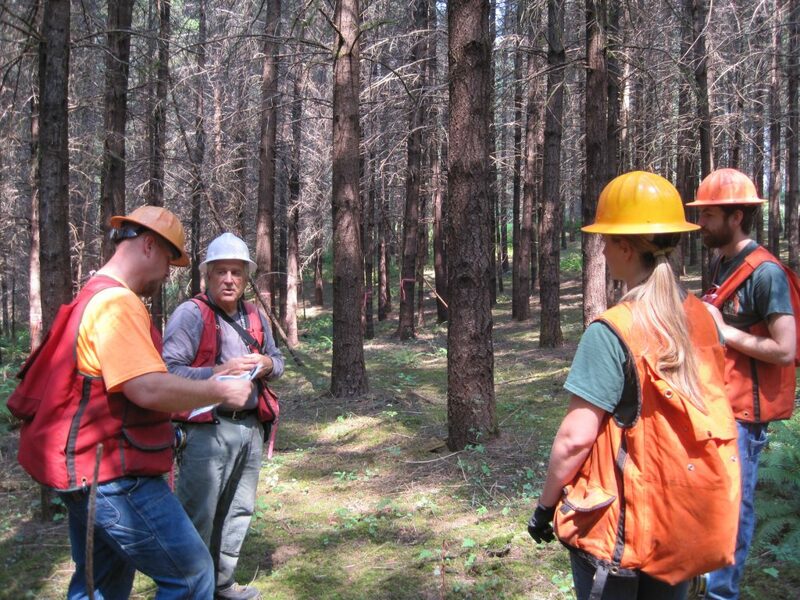 At Matteson, we will be treating about 29 acres of Douglas-fir plantation about 30 years old. Because of our education and demonstration mission, we will implement several different prescriptions in different treatment areas across the acreage, for comparison. The first thing we needed to develop our thinning plan was some stand data. We have installed a network of 0.1-acre permanent inventory plots across the property, and eleven of those plots fall in the area to be thinned. The plot data showed that on average, the stand density is about 250 trees/acre and most trees are between 9 and 14 inches DBH. Putting each plot on a density table, we see that most of the stand is in the “Danger Zone” meaning that it is too dense. Ideally, thinning should have been done a few years ago. Aside from the numbers, visual cues tell us that the stand is in the Danger Zone. There is very little vegetation on the ground, the trees’ live crowns are receding to around 1/3 of the total tree height, and there is scattered competition-induced mortality. Our objectives with the thinning are to produce income, improve stand health, and set the stand up to produce high quality timber in the future. We also want to show how thinning can be implemented in different ways, to achieve different objectives. Over most of the unit, we chose a “future pole” thinning prescription. Poles have high value, but trees must meet exacting specifications. In essence, this treatment involves cutting trees that will never make a pole because of defects such as spike knots, double tops, or too much sway in the trunk. Any tree that has pole potential (straight, few knots, etc.) will be left, regardless of crown class. If this prescription results in areas that are still too dense, then those areas will be thinned from below; if it would leave areas too sparse, then in those areas some non-pole trees will be left. In this sample marked area, the painted trees are to be cut. We set aside a few demonstration areas for other prescriptions. We’re still working out the specifics of these alternatives, but we have a few ideas we are working with. One is a standard thin from below, removing the smallest/most defective and leaving the remaining trees as evenly distributed as possible. For example, out of each group of four trees two would be cut. This would remove half of the trees (but only about a third of the volume) and leave the remaining trees with plenty of room to grow. I estimate that most of the stand would move to the “Lower Goldilocks” zone under this scenario (not too dense, not too open, “just right”: see above table). However, one of the concerns about thinning an overly dense stand is that the trees left behind are unstable when too many of their neighbors are cut. So if we wanted to be more conservative and do a lighter thin, we could cut two of every five in the same way. But, this would be less profitable and also mean that the stand would close up again very soon. Either of these prescriptions would be easy for us to mark and for the operator to follow. However, they perpetuate a uniform, plantation-style stand with low structural diversity. What if we wanted to mix it up? One idea is to thin from below with a diameter limit: cut anything 11” DBH and smaller, and leave anything 12” DBH and larger. Exceptions to the rule could be made, for example if a 12” tree has a defect and an 11” tree next to it has good form, the 12” tree would be cut and the 11” tree would be kept. Because this prescription is based on tree size rather than spacing, we’re expecting it would result in a patchier arrangement of leave trees that would still have plenty of room to grow. Going further, we could do a “structural diversity makeover” thin, to demonstrate a way to actively move a uniform plantation to a more diverse forest. We could thin from below across most of this area, but then cut all the trees in a few gaps, to encourage understory vegetation or even tree regeneration. We could even strategically place these gaps in places where there is already a hardwood shrub or two. Because the processor needs to cut 12-foot corridors to travel through, and can reach in 30 feet on either side, we could also place our gaps along the corridors. Finally, we can create snags, by marking trees for the processor to cut up high – like 15 to 20 feet up. Trees with a defect in the lower bole would make good candidates for created snags. Finally, a couple small areas won’t be thinned at all, just to demonstrate how that plays out. One of these surrounds an old piece of farm machinery left from one of the homesteads that were on the property. Because this is considered a cultural resource, we want to avoid disturbing the site, so putting our unthinned area around it makes sense. 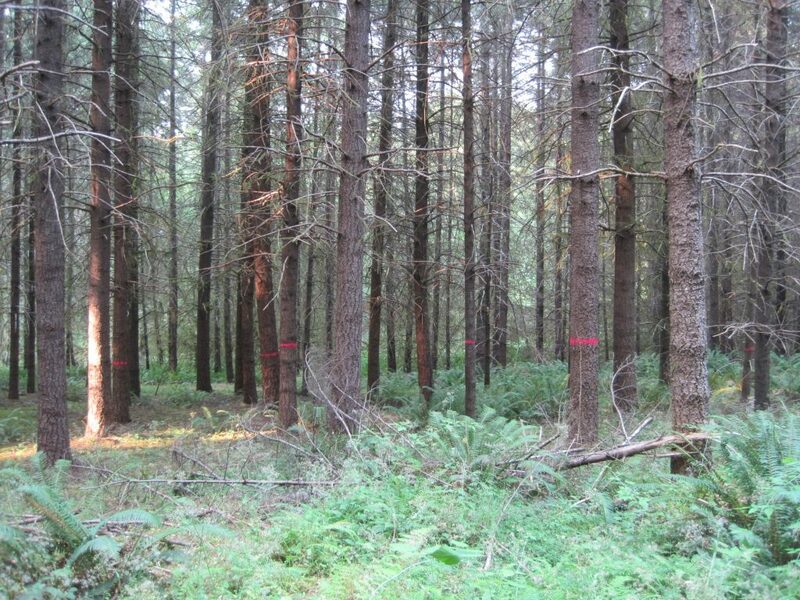 It’s often said that silviculture is a blend of science and art. We can look at data and design prescriptions on paper, but ultimately conditions in the stand will also influence what we do. And that is where marking the stand comes in. It’s very time consuming to mark an entire large stand, so the Research Forests crew marked some sample areas of the “future pole” prescription. The contractor will work in these areas first to get a feel for the prescription, then move to unmarked areas. For more complex prescriptions, such as the “structural diversity makeover”, we will probably mark the whole demonstration area (each one less than an acre). What do you think of these thinning scenarios? Is there something else you would like to see?